Alvanon, The Global Apparel Business Expert, has named women’s fashion designer Rosie Assoulin to its Mentorship Program. The announcement was made by Alvanon CEO Janice Wang. Under the program, Alvanon will strengthen Assoulin’s existing business competence with statistical sizing data, technical design tools and training in key areas of the art and science of fashion, including production, supply chain issues, fit, marketing and sales. “Rosie is a perfect candidate for our Mentorship Program,” Wang says. “She has been in business for just over two years and is already an accomplished, inspired and professional designer. Her enormous talent was recently recognized by the Council of Fashion Designers of America when it presented Rosie with the 2015 Swarovski Award for emerging designers in the women’s wear category. The Rosie Assoulin brand is American sportswear sophisticate, and ranges from elegant eveningwear to sports and leisurewear. Assoulin notes that her business will benefit from Alvanon’s mentoring in several ways. Assoulin’s studio and manufacturing facilities are all NYC-based, and her distribution is worldwide, through leading department stores, boutiques and web site businesses. Alvanon was founded in 2001 when it developed a unique and innovative data-driven approach to solving the challenges of sizing and fit inherent in the apparel industry. Since that time it has evolved into a global consulting firm advising the world’s leading apparel organizations on how to align their internal teams, processes and supply chains; more intimately engage their existing and target customers; and innovate to optimize profitability and achieve their growth objectives. It has amassed a wealth of expertise across every key industry discipline including consumer analytics, concept and technical design, product development, manufacturing, quality, sourcing, planning, merchandising, distribution, marketing, e-commerce and training. Alvanon works with its clients across multiple apparel sectors in 89 countries. It operates from its head office in New York, European headquarters in London and Asia office in Hong Kong. Alvanon also has research, development and manufacturing facilities in Donguan and Shenzhen in China. 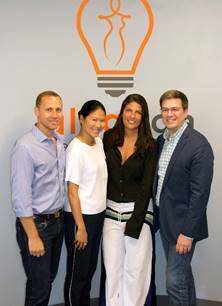 Photo at top of article: From left: Max Assoulin, Alvanon CEO Janice Wang, Rosie Assoulin and Executive Director, Alvanon Inc. Don Howard.